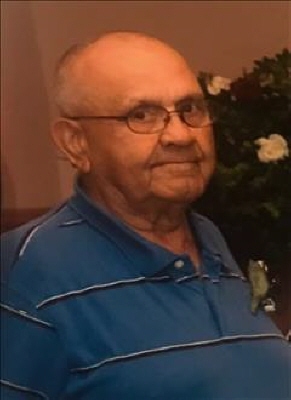 Benjamin Detrixhe, 91 year old Mooreland resident, died Tuesday, November 27, 2018 in Woodward, Oklahoma. Funeral services will be held at 10:00 a.m. Friday, November 30, 2018 at the First Baptist Church of Mooreland with Reverend David Houchin officiating. Interment will be at the Higgins Cemetery at 2:00 p.m.
Benjamin Detrixhe was born on January 22, 1927 in Higgins, Texas to Benjamin and Barbara Belle (Mercer) Detrixhe. He grew up in Higgins, Texas and attended school there. Benjamin was inducted into the United States Navy and served his country during World War II before being honorably discharged. He owned and operated the grocery store in Higgins for many years before going to work in the oil and gas industry. He worked for Texas Oil and Gas which later became Marathon Oil and Gas until his retirement. He was united in marriage to Jo Ann Neu on March 16, 1985 at the First Baptist Church of Mooreland. Benjamin enjoyed fishing, gardening and golfing and lived at Lake Texhoma before moving to Foss Lake. He is survived by his wife Jo Ann Detrixhe of the home; two sons: Clendon Detrixhe and wife Dia of Tuttle, Ira Smith and wife Cathy of Mooreland; two daughters: Cindy Fields and husband Joe of Mooreland, Debra Rounds and husband Kenny of Leedey; 12 grandchildren; two adopted daughters: Tammy Detrixhe and Traci Detrixhe; 13 great-grandchildren; other relatives and friends. He was preceded in death by his parents, one brother Jack Detrixhe, three sisters, Francis, Barbara and Silvia and a daughter Vickie Shawcross. Memorial contributions may be made to the Mooreland First Baptist Church, Childrenâ€™s Ministry with the funeral home accepting the contributions. To send flowers or a remembrance gift to the family of Benjamin Detrixhe, please visit our Tribute Store. "Email Address" would like to share the life celebration of Benjamin Detrixhe. Click on the "link" to go to share a favorite memory or leave a condolence message for the family.